The new ResMed AirTouch F20 UltraSoft™ memory foam cushion represents a breakthrough in patient comfort. The permeable foam creates a breathable seal that reduces facial markings and skin irritation. Like the AirFit F20 (which shares the same frame and headgear), the AirTouch features magnetic clips, a quick release swivel elbow, and simple design that makes it fast and easy to put on as well as clean and reassemble. This is one of the best sealing full face masks that we have seen. It can hold a seal to pressure settings up to 25 cm/h2o, and it is a very effective solution for men with facial hair. The suppleness of the memory foam cushion allows it to hug the contours of your face like a custom fit, which also helps to reduce those red pressure marks that a lot of us have to live with in the morning. However, this exceptional comfort does come with a cost - the recommended replacement interval for these cushions is 30 days, and under no circumstances should water or liquid cleaning products be used on the cushion - otherwise the memory foam will become saturated, which will ruin the cushion. Instead, we recommend wiping the surface of the cushion with a damp cloth or a mask cleaning wipe. Designed to reduce facial markings and skin irritation – even when sealed firmly against the skin – AirTouch fits 98% of patient faces. Permeable foam creates a uniquely natural, breathable seal that allows some excess heat and sweat to escape through the cushion without compromising therapy pressure. Compatible with any CPAP, including the world’s smallest CPAP, ResMed’s new AirMini™. Easy to maintain and designed to seal at a range of therapy pressures, and to fit the same mask frame as the AirFit™ F20, which uses the InfinitySeal™ silicone cushion – so patients can easily try and choose the material they prefer best. other full-face masks were too rough on the bridge of my nose, leaving me with red marks and sometimes blisters. I was really hopeful this mask would be an exception, but after a few days of use, the blisters are back on the bridge of my nose. This was the most comfortable CPAP mask I have worn. Unfortunately, the foam tears around the bridge of the nose. The first AirTouch F20 lasted 27 days which wasn't too bad. The second tore after 5 days. I have had to switch masks as these don't last long enough for the price. Able to breath from mouth and relax jaw. Nice for those with those issues. The product itself is outstanding. Q: Can this mask be cleaned in a SoClean sanitizer? A: We don't sell the SoClean so I would recommend you check with them first. That being said I think it would be fine. You can't get the memory foam wet so ResMed recommends you wipe the cushion off with an alcohol-free wipe each day. 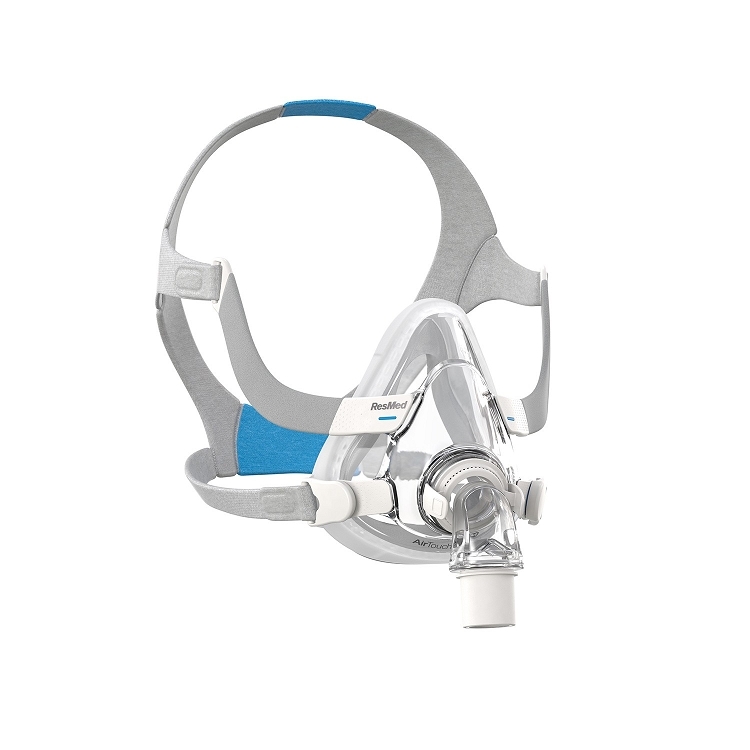 Q: Is the sizing on this mask the same as the airfit 10?, I have a med but feel it is a little large, the other ? Is, can you change mask sizes w/o having to change the head gear? Do you take insurance? Q: Are the foam face seal replaceable, or us it part of the mask? A: Yes, you can replace the cushions on this mask but the foam is attached to the plastic shell so you replace that portion as well. The part numbers are 63028, 63029, and 63030. Q: Is the memory foam latex free? A: I can't find a latex statement on the product itself but customer service at ResMed says it is latex free.